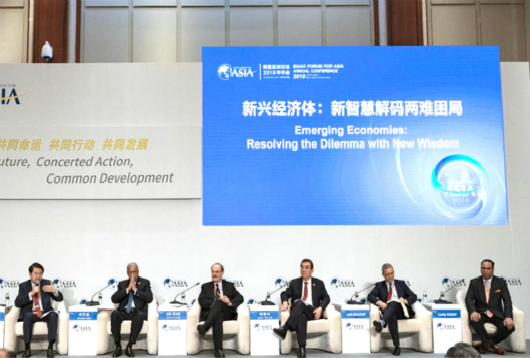 Under the theme of “Shared Future, Concerted Action, Common Development,” politicians, business representatives and scholars from more than 60 countries and regions discussed future developments in Asia and the world at the Boao Forum for Asia (BFA) Annual Conference 2019 in Boao, Hainan, March 26–29. The global economy is faced with increasing unstable and uncertain factors. Wei Hao, director of the Department of International Economics and Trade at Beijing Normal University, said that in the wave of economic globalization, every country that has participated in globalization and in the international division of labor will find it difficult to return to a closed economy. It is a rational choice for all countries in the world to work together to strengthen cooperation and openness, especially for export-oriented Asian countries. In recent years, due to the rising structural contradictions of world economic development and ever-increasing divergence over the ideas of development, the sense of identity with the existing multilateral rules has diverged, seriously affecting and disrupting the recovery and prosperity of the global economy. Huo Jianguo, vice chairman of the China Society for World Trade Organization Studies, said that it is imperative to firmly support the global multilateral trading system and the development of an open economy. This is not only a need for world development, but also an inherent need for the development of the Chinese economy. The Asian regional economy is still full of vitality, according to the four academic reports released at the conference on emerging economies, Asia economic integration, Asian competitiveness and Asian financial development. Asia will be the hope of global economic and social development in the 21st century, said Sheng Bin, dean of the School of Economics at Nankai University. The large populations, prosperous markets, safe societies, virtue of hard work, intelligent innovation and progressive governance . . . all these have laid the foundation for the cooperation of Asian countries. To enhance regional cooperation in East Asia, it is necessary to address political, security and diplomatic issues and clear obstacles to cooperation through strategic mutual trust. Sheng also suggested focusing on trade, investment and monetary cooperation to achieve greater market access, business facilitation and regulatory integration. “In the face of current complex changes in the world, most of the emerging countries in Asia still maintain good economic performance,” Huo said. Most countries and regions in Asia still maintain strong resilience, which fully reflects the potential and vitality of their economic growth. As long as Asia sticks with developing an open economy, adheres to the correct direction of trade liberalization, and constantly overcomes the contradictions and difficulties in the development of globalization, it will certainly be able to move toward new prosperity. The Asian region, especially East and Southeast Asia, has long existed as a regional or even global production base. Song Hong, deputy director of the Institute of World Economics and Politics at the Chinese Academy of Social Sciences, said that the current integration of Asian economies is still not strong enough, mainly because Asia lacks an enormous developed economy as a final market to drive the development of the entire region. With the growth of China’s economy and the Belt and Road, it may be possible to gradually change this situation and form a truly integrated Asian regional economy. Wei pointed out that Asian countries should reduce the various barriers to trade and investment, optimize resources, continue to consolidate, stabilize and strengthen cooperation in various industrial value chains, and enhance the status of Asia in the global value chain to achieve mutual benefit. The new round of scientific and technological revolution has rapidly promoted the transformation of global production and governance modes, and innovation has become the first choice for the prosperity and development of Asian countries. Yin Zhichao, dean of the School of Finance at the Capital University of Economics and Business, said that a new round of scientific and technological revolution represented by big data, artificial intelligence, blockchain and other technologies is profoundly changing the world and human behavior. China’s huge economy provides big data that is hard to imagine in other countries, providing unique conditions for the development of such technologies as machine learning and artificial intelligence. Yin said that we can take advantage of the opportunity to provide a relaxed environment for technological innovation and strive to take a lead in the forefront of the new round of scientific and technological revolution. Innovation plays an outstanding role in current global economic competition. However, the technical barriers in the high-tech field are showing an upward trend, featuring increasing competition and insufficient cooperation. Huo said that China has made significant progress in technological innovation in recent years, but there are still gaps in many core technologies. Therefore, accelerating innovation-driven development remains the primary goal. In the face of complex international competition, we must continuously strengthen and enhance our independent innovation capabilities. At the same time, Huo said, we must strive to find new open partners and expand the new path of open cooperation.